The success of every organization relies on the hard work and dedication of its staff. This is especially true for nonprofits, most of which are volunteer-run. My career began while interning for one, and I’m serving on the leadership team for another. For the purpose of this post, I’m going to talk about a very specific group of volunteers—the Black Shirt Team. 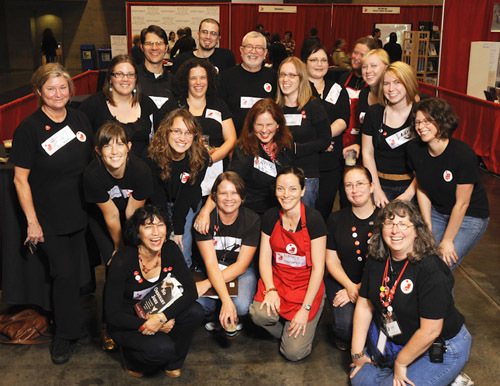 The Black Shirt Team is a group of individuals who spend countless hours and infinite email threads planning, coordinating, launching, and managing the massive book festival that is known as Wordstock. They are professionals looking to stay involved in their community, they are graduate students gaining experience to launch their career, and they are passionate individuals looking to support a cause they believe in. On Sunday night after the festival closed the doors on its sixth season, the Black Shirts went out to celebrate. I looked around the bar at people who I have known in various ways throughout my involvement with Wordstock—the event manager who has been with the festival from the start, the executive director who has shaped what the festival has matured into, core volunteers who I worked with during year one, and new faces who I deeply respect for the fresh ideas they bring. I have worked four out of the six festivals and have seen many of the core volunteers who began during year one and move into increasing levels of responsibility ever since, many of which were able to pin their own “sixth year” button on their lapel. By “we,” of course, I mean all the people listed on the page to the left, and all the people represented by the logos that grace the back cover of this program: our volunteers and sponsors. Simply put, Wordstock would not exist without their passion and dedication. I can’t thank them enough for their tireless work and hope you’ll thank them, too, when you see them at the festival’s many events. This paragraph is a snippet of the toasts and cheers that were passed around Sunday night as the team celebrated an end to another great festival. I am thankful to have watched Wordstock transform over the years and to have the opportunity to work with each and every person on the Black Shirt team. Cheers to the seventh edition! This entry was posted on Monday, November 22nd, 2010 at 10:12 pm and is filed under book world, nonprofit. You can follow any responses to this entry through the RSS 2.0 feed. You can leave a response, or trackback from your own site.